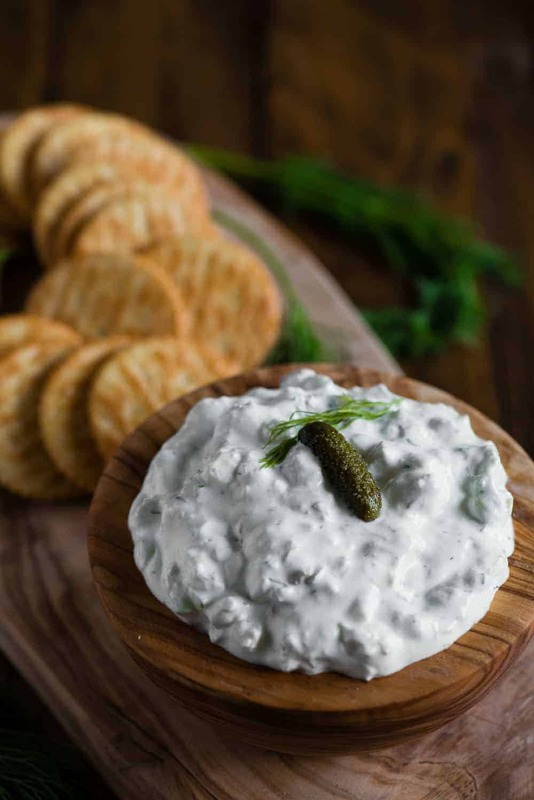 Dill Pickle Dip is a light and creamy dip made with cream cheese, sour cream, pickles and fresh dill. This easy appetizer recipe only takes minutes to make! Some people might be surprised when they hear you made a dill pickle dip, but it is always the hit of any party. 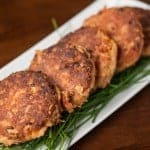 Pin it to your EASY APPETIZER BOARD to SAVE it for later! 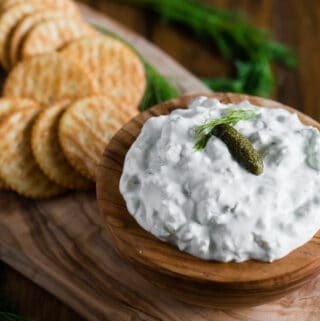 If you’re looking for a super quick and easy dip to share at a potluck or a party, everyone will be surprised at how delicious this dill pickle dip is! 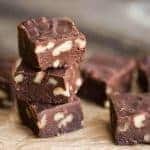 At first I was very skeptical that it would taste good, as were my friends who were over when I made it. I served it up with some crackers and everyone could not get enough. This stuff is strangely addictive! I can’t seem to get enough dill pickles lately <insert crude joke here>. I must be deficient in something, because I have been craving pickle-everything lately! I already shared my recipe for dill pickle soup, and fried pickles and dill pickle deviled eggs will be shared with you all soon. What is dill pickle dip? 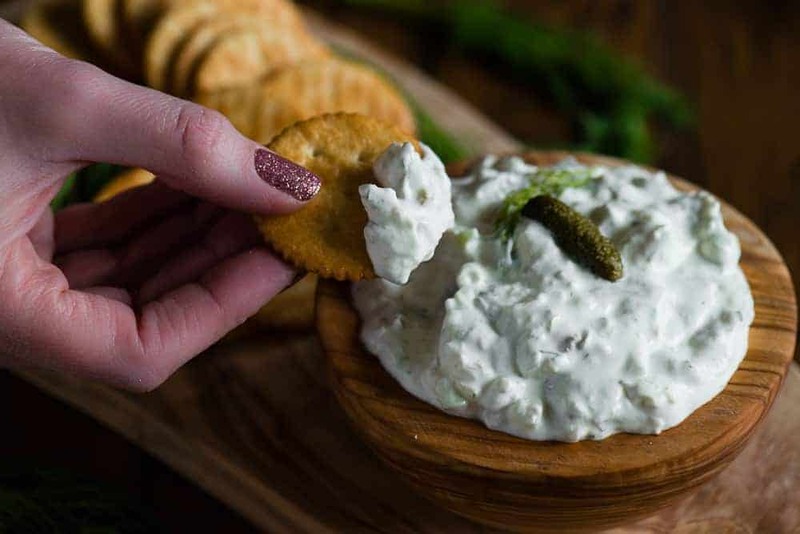 Dill pickle dip is basically a cold creamy dip that is flavored with chopped up dill pickles as well as pickle juice (i.e. pickle brine). The amount and intensity of pickle flavor really depends on the pickles you use. 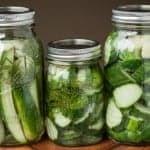 I have a ton of homemade pickles that I grew and canned myself last summer, but store bought pickles will work just fine! Either way, I highly recommend using your favorite dill pickle and to stay away from anything sweet. Tiny little cornichon pickles make for a great garnish and conversation starter! There are quite a few recipe versions out there. 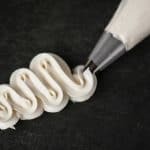 Some recipes use mayonnaise, and although I’m a huge fan of mayonnaise and even make my own homemade mayo, I opted to omit it from this recipe. I figured that mayo adds tang, but I didn’t want it to compete with the tang from the pickle. It’s all about the tang! To make this dill pickle dip extra cream, I use my stand mixer. You can certainly mix this dip by hand, especially if your cream cheese is extra soft, but I find it just as easy to use the stand mixer. I start by whipping the cream cheese until it is light and fluffy. If you don’t do this first, then you’ll have little bits of cream cheese that never get mixed in. Then I just add the remaining ingredients that include sour cream, chopped pickles, pickle juice, green onions, fresh dill, and garlic powder. You can hold off on adding the salt until you taste the dip. The best part about using pickle juice is that you can change the amount depending on how thick or thin you want your dip to be. 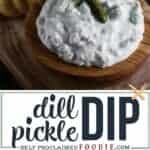 Dill pickle dip is a pretty versatile dip, meaning you can serve a wide variety of things with it. I chose round butter crackers and it was an amazing combo. I would think any type of cracker would be really good. Tortilla chips are an option but I’m not sure that’s what I would choose. You can never go wrong with a sliced baguette when you’re serving a creamy dip like this dill pickle dip. Oh man. Now I’m getting hungry. And, of course, raw veggie sticks are always a great option to serve with a dip like this. 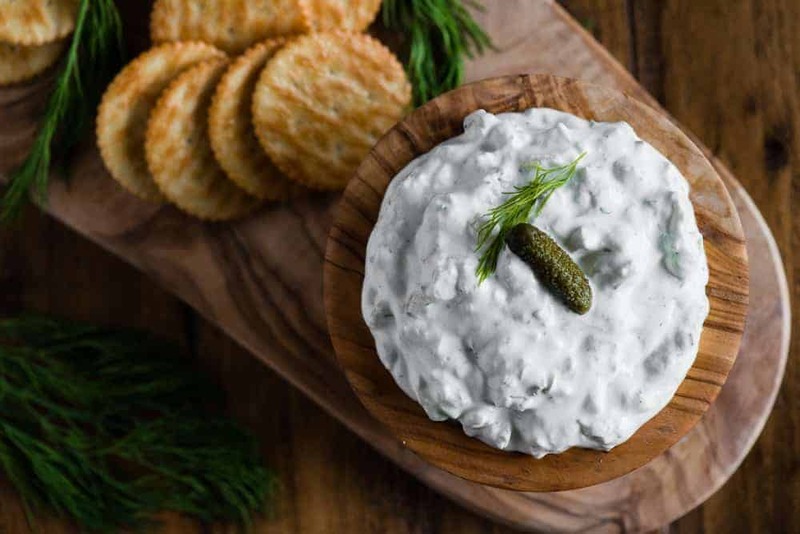 Dill Pickle Dip is a light and creamy dip made with cream cheese, sour cream, pickles and fresh dill. This easy appetizer recipe only takes minutes to make! 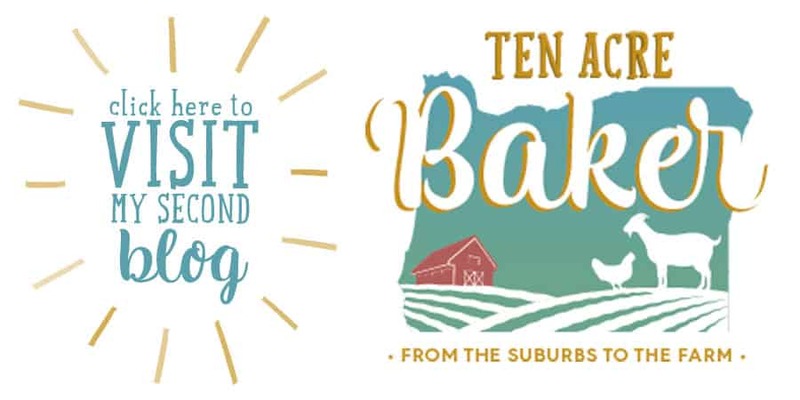 Using a stand mixer or electric beaters, beat cream cheese until light and fluffy. You can't really over mix it, so whip it until it is very smooth. Mix in remaining ingredients except for salt. Scrape bowl as needed. Once fully mixed, taste to determine if salt is needed. Serve with chips, crackers, or fresh vegetables for dipping. This dill pickle dip also works great as a spread on sandwiches! Recipe makes about 1 1/2 cups of dip. This dip looks delicious! Thank you for sharing. Cannot wait to make this at home.